Low Calories, Low Sugar, Low Fat has never tasted so good! Skip the fattening sweets and indulge in these delicious and totally satisfying Skinny Frappes. 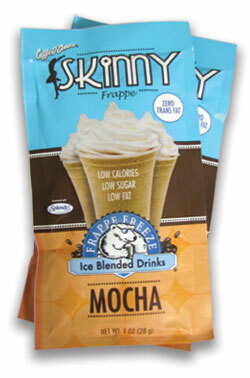 Blend with skim milk and ice, or go crazy by adding your favorite flavored sugar free syrups or espresso. Zero Trans Fats! Click to order your Skinny Frappe Mocha.